Templates are the building blocks of the Interfolio Review, Promotion & Tenure program. They allow Administrators to create a standardized, repeatable process for all review cases in their institution, colleges, schools, and departments. Templates save details like packet requirements and steps of review for the entire faculty action process. If your institution uses the Enterprise version of our Dossier product, you can establish guidelines when creating a template, and make those guidelines visible so that your faculty or staff can use them to prepare for future reviews. A template is created and saved at a unit level (a college, school, or department), which limits where it can be later used. For example, when a template is assigned to the institution-level unit, it will be available to the entire institution. When a template is assigned to a college-level unit, it will be available to that college and the departments beneath it in the hierarchy. When a template is assigned to a department, it will only be available in that department. 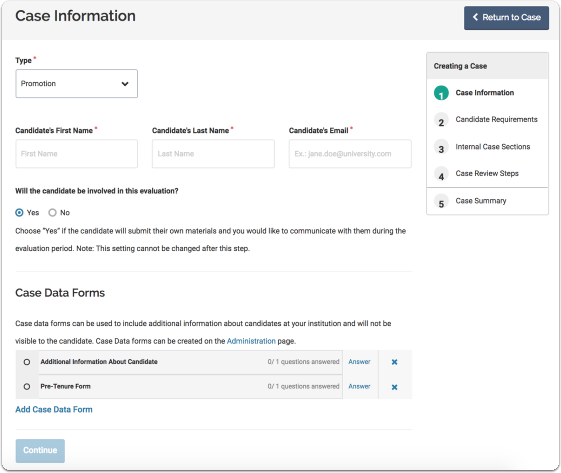 Once you create a template, you can use it to build individual cases without having to remember or repeat the standardized process at your institution, college, or department, however, because it is possible to modify any template to fit specific information for a candidate, you can think of a case as a customized template. You can create multiple cases at one time, all based on a single template. All of the components of a template can be changed or edited to fit the needs of a particular individual’s review process when creating a case based on the template.